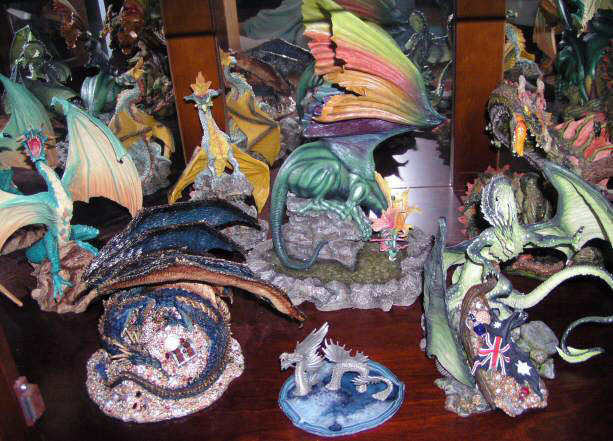 While I've technically been collecting dragons for 8 years now, it is only in the last 2-3 years, when I got into the better pieces made by Enchantica, Dragonsite, Franklin Mint and Danbury Mint that the collection really began to take off. I have recently relaxed my collecting a little, though I still pick up a new piece now and then when one catches my eye. I do have a few favourites. Generally, I'm very fond of the Enchantica Shannarah, Dragonflight, Bethor, Karaxus and Xedrethor. All the Danbury Mint dragons in my collection are among my favourites, as is the Dragonsite Vansal, Rob Simpson's Yeuaan, Franklin Mint Smaug and of course, the Franklin Mint Clash of the Time Lords. The collection is housed all throughout my room, with the two glass cabinets, shelves and bookcase (that should be dragoncase) as the main holders of the collection. 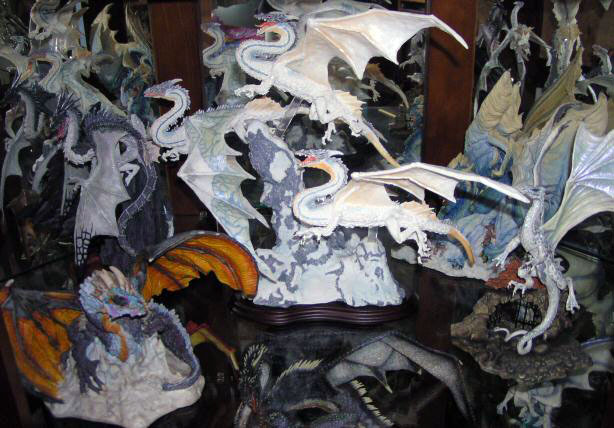 There are some pieces not pictured, but most of the dragons are shown. The only large piece not included here is a dragon fountain, and some pictures, including the framed original of "Inside the Glasshouse" (painted by my sister as a Christmas gift). I'm a horrid photographer so I apologise for the picture quality. 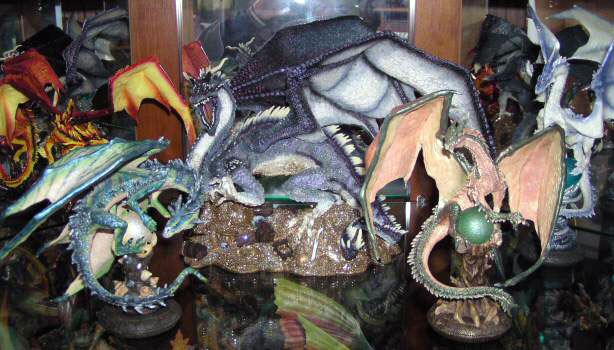 (L-R); Franklin Mint Smaug (at back); Dragonsite Alhyme; Enchantica Shannarah; Enchantica Mangra; Dragonsite Renaissance (at back). 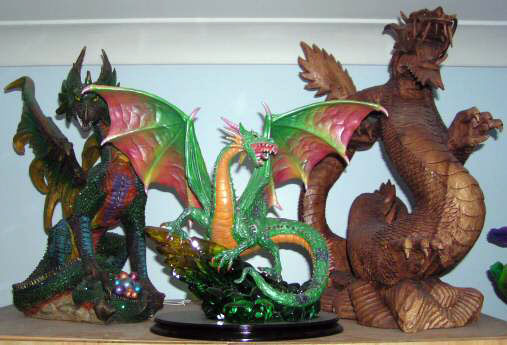 (L-R); Enchantica Bethor; Enchantica Grymwarg (at back); Enchantica Dragonflight; Enchantica Kellrass (at back); Enchantica Karaxus (second edition). 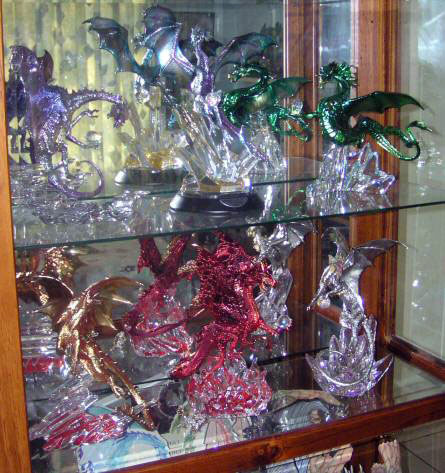 (L-R); Fire: Elemental Dragons (at back); Water: Elemental Dragons; Enchantica Glimmerscale; Earth: Elemental Dragons; Air: Elemental Dragons (at back). 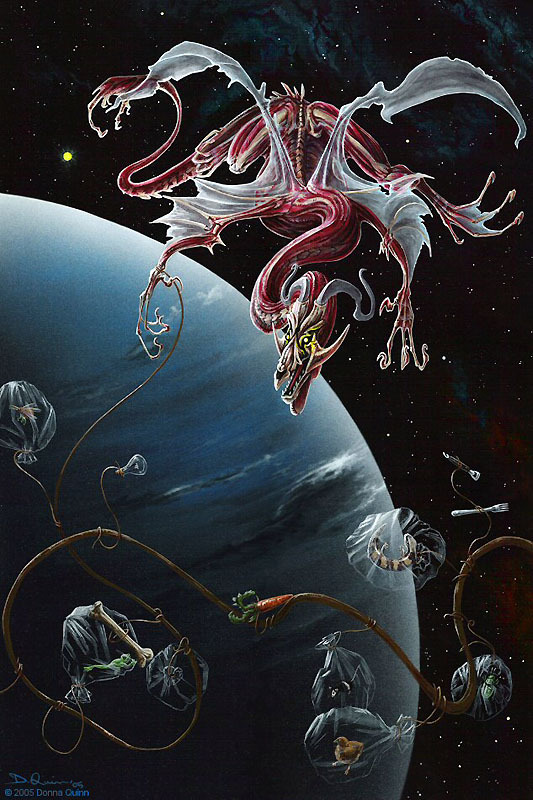 (L-R); Enchantica Tzabazeus; Rob Simpson Yeuaan; Enchantica Jabel (at back); Dragonsite Vansal; Andrew Bill Marauder; Enchantica Jaggerang (at back). 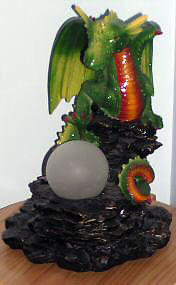 At front: small pewter dragon sitting on agate. (Top shelf L-R); Guardian of the Skies; Guardian of the Mystic Sword (limited Artist Edition);Guardian of the Raging Waters; (bottom shelf, L-R); Guardian of Dragon Gate; Guardian of Fire; Franklin Mint Fantasy Sculpture. (L-R); Danbury Mint Slorn-Drambar; Enchantica Xedrethor; Danbury Mint Petvarthnian. (L-R); Danbury Mint Verendi; Danbury Mint Draco; Enchantica Silverflame (small blue dragon at front); Danbury Mint Droxtharg; Enchantica Shyira; Enchantica Bloodstar (small white/ red dragon at front); Danbury Mint Kellentz. Assortment of plush dragons, some easier to spot than others. 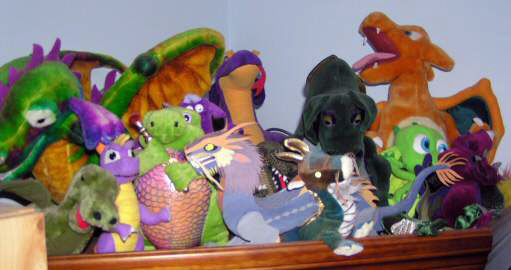 A few more plush dragons, with some more statues (most off-camera) which couldn't fit anywhere else in the room. Some of my older dragons, from the early days. 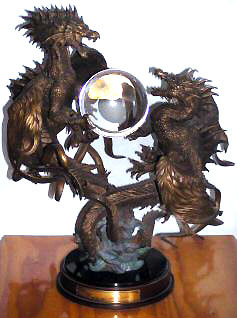 The two Tudor Mint Mountain Dragons (left-hand side) from the "Land of the Dragons" range are the only relatively well-known company represented here. My very first dragon is the small green dragon sitting on the left side of the red/ orange dragon. I have sold a lot of my lesser-quality dragons I no longer like so much, but have kept the ones I still like, and of course the very first ones for sentimental reasons. 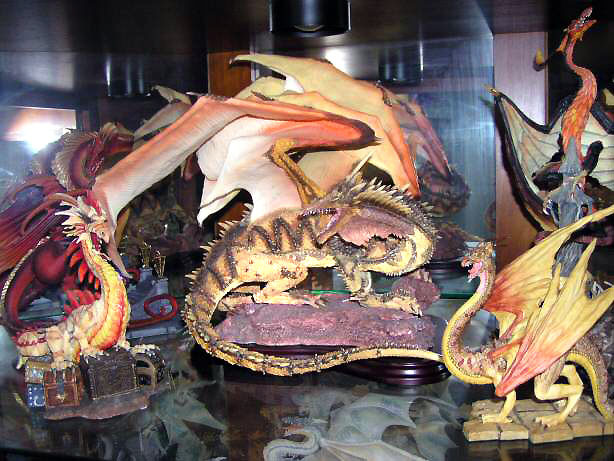 The bottom shelf contains the rest of the assorted dragons. The large green dragon on the right-hand side of the shelf I'm quite fond of, and it is the only cartoon-ish dragon I own. The purple dragon with the dragonfly on it's tail was given as a Christmas present from my mum, who hand-made the gorgous piece. It's much more friendly-looking than most of the other dragons in the collection, and it's another one I like a lot. 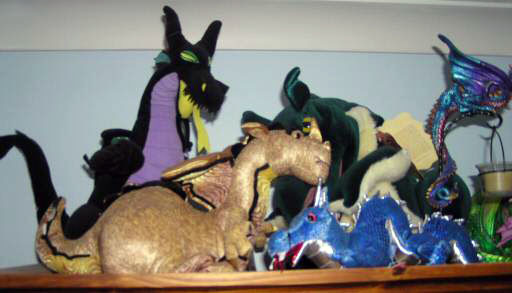 At the top of the wardrobe reside my two largest dragons, with a smaller green dragon in front. The base (crystals) of the green dragon actually light up when plugged in, and the effect is really neat. Franklin Mint "Clash of the Time Lords". This is the most expensive piece in the collection, and it is an amazing work of art. The piece is by well-known fantasy artist Julie Bell and is made of bronze. It's absolutely gorgous. This is a second dragon light. The orb in front of him changes colour and it looks as though mist is swirling in the orb. The effect is relatively subtle, and quite nice. He's another friendly-looking dragon. Despite the entire top of the bookcase being dominated with dragons, the books manage to fit in in the shelves below! Again these are some of my older pieces, with the Tudor Mint Ice Dragons from the "Land of the Dragons" in this picture, and a Royal Selangor Imperial Dragon (on the right-hand side of the large blue dragon). Next to the large green dragon and behind the pewter dragon with its raised wings is another Tudor Mint piece, this is "The Great Sun Dragon" from their "Myth & Magic" range. Some small prints of some of my sister's lovely (albeit now quite old) artwork are stuck to the wall behind the bookcase.